Wed., Nov. 8, 2017, 10:53 a.m.
MADRID – Pro-independence protesters blocked roads and stopped commuter trains Wednesday in Spain’s northeastern region of Catalonia as part of a general strike to protest the jailing of ousted Catalan government officials and secessionist activists. 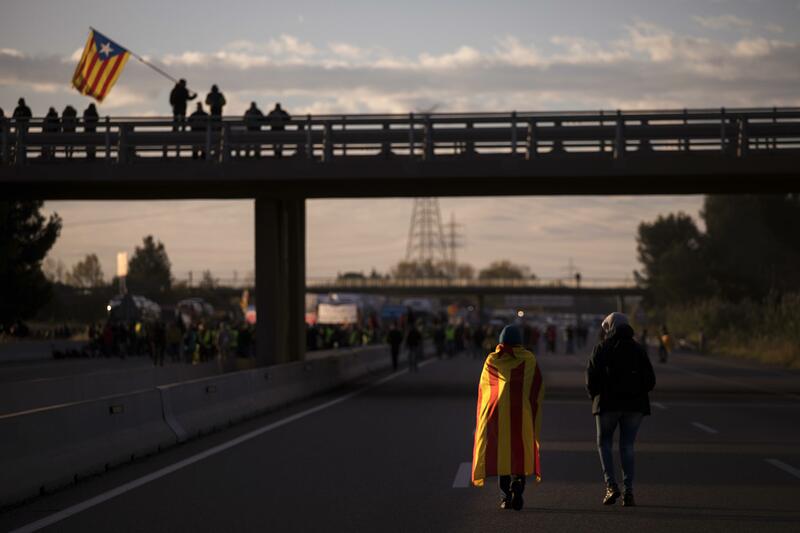 Many of the blockades were on roads leading to major Catalan cities, including the regional capital Barcelona, and major highways, the Catalan Transit Service said. Disruptions affected more than 60 sections of road and highway throughout the morning, it said. National railway operator Renfe said services were halted on dozens of local lines as protesters blocked railway lines. Several national high-speed lines were also affected. In northern Girona, several protesters pushed past police controls to enter the city’s main railway station. Intersindical CSC, a platform of pro-independence workers’ unions, had called the strike for labor issues. But separatist parties and civil society groups asked workers to join the stoppage to protest the Spanish government’s moves against the Catalan bid for independence. The strike wasn’t backed by Spain’s two main unions and wasn’t reported to be having any major effect on industry or in the region’s prized tourism sector. At mid-day, several thousand pro-independence protesters packed a central square in Barcelona, waving separatist flags and chanting “Freedom” for the 10 people in custody in a judicial probe into rebellion and sedition in the days before and after Catalonia’s parliament ignored Spanish court rulings and declared independence Oct. 27. Agusti Alcoberro, the vice president of the grassroots Catalan National Assembly told the crowd the arrests were “an attack on democracy and a humiliation” of Catalan people. Spanish authorities took the unprecedented step of seizing control of Catalonia, one of Spain’s 17 autonomous regions, after a majority of regional lawmakers there ignored Constitutional Court orders and passed an independence declaration on Oct. 27. Spain removed the regional government, dissolved the parliament and called a new regional election for next month. Prime Minister Mariano Rajoy said Wednesday the elections should open “a new political era” in the region with the return to normality and respect for Spain’s laws. Eight members of the dismissed Catalan Cabinet and two activists were sent to jail as a Spanish court studies possible charges of rebellion and sedition against them. Former Catalan regional president Carles Puigdemont and four of his aides have fled to Brussels, where they are fighting Spanish arrest and extradition orders. Their presence in the European capital is sowing divisions within the Belgian government. Some Belgian lawmakers have criticized Prime Minister Charles Michel for not taking tougher action against Puigdemont, and others complain that the Catalan leader’s presence was inflaming Flemish separatists in Belgium. Speaking to Belgian lawmakers on Wednesday, Michel refused to comment on Puigdemont’s political actions, saying that his case must be handled by judicial authorities alone. “Mr. Puigdemont is a European citizen who must be held accountable for his actions just like any other European citizens – with rights and obligations but no privileges,” he said. Michel also stressed that the Spanish government remains his partner. Catalonia, with 7.5 million people, represents a fifth of Spain’s gross domestic product and polls show its people roughly evenly divided over independence. Puigdemont claimed a banned Oct. 1 secession referendum gave it a mandate to declare independence. Published: Nov. 8, 2017, 10:53 a.m.